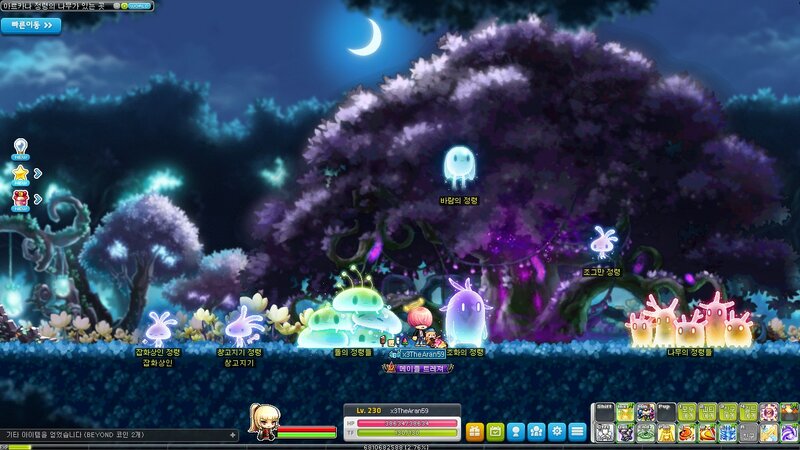 NOTE: MapleStory BEYOND update is also known as Override update in GMS/EMS. At the top of the nightmare clock tower, Lucid's nightmare began again! Combine your strength to clear the Dream Breaker. When cleared, you will be rewarded Dream Coins and you can use x30 Dream Coins to exchange for x1 Arcane Symbol: Lacheln! Destroy Nightmare Music Boxes and save the residents trapped in the Dream City! 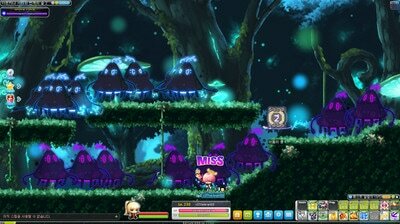 How to Access: Top of the Clock Tower of Nightmares or the Maple Guide (Level 220) via NPC Dream Rag Doll. Upon entering, you'll have 3 minutes to protect the Sleepy Music Boxes and destroy the corruption of Nightmare Music Boxes! Destroy Nightmare Music boxes and turn the gauge completely yellow to clear the stage within the time limit. When the gauge is completely purple due to Nightmare Music boxes, you'll fail the stage. There is technically no limits on the number of stages in Dream Breaker, so do your best till the very end! Based on your highest clear record, you can choose to begin at the 1st Stage or any 10th stage that you have previously cleared. The Tactics Board UI provides various information and useful skills, to aid you while you're in Dream Breaker. There are 5 Rooms in the map, each of the rooms having it's own Music Box. Protect the Music Boxes from nightmares! You can view the information of each Music Box of each Room using the UI. 4 Tactics skills are available to aid you using the cost of Dream Points, which can be obtained by clearing Dream Breaker Stages. Each Tactic Skills can only be used ONCE per stage, so you are recommended to use the skills wisely. The list of effects of the Tactic Skills is as follows. EXP based on the highest cleared stage. You can exchange 30 Dream Coins for Arcane Symbol: Lacheln via NPC Dream Rag Doll. The Top 5 players of the week will be placed as Character Statues on the right side of Lacheln Downtown. During the ranking reset period, Sunday (23:30) to Monday (00:30), you'll not be able to access the content. Talk to the Top 5 Dream Breakers, and you can obtain EVEN MORE Dream Coins! Simply talk to the Top 5 Character Statues in Lacheln Downtown after finishing Dream Breaker 3 times a day to receive the bonus Dream Coins. Every 10 stages from the 30th Stage onwards, you'll be able to receive various medals up to the 100th stage. These are the medals you can obtain. ​New Challenges arise! The Formidable Foes returns! Mu Gong has revamped his dojo once again, bringing new heights and challenges. The Dojo has now been expanded to the 63rd Floor! Cygnus and her Knights waiting for you between the 51st ~ 56th Floor. Mu Gong's disciples awaits you between the 57th ~ 62nd Floor. All Monsters / Bosses in Mu Lung Dojo will now feature the new Personality System, which allows them to do one of the following. Dash towards you to attack in a close range. Attack you within a distance. Teleport randomly to attack you. All Monsters will also be able to use Special Skills as follows. Attack speed is increased if the monster is inflicted with abnormal status effects. Heal HP if the monster is inflicted with abnormal status effects. Revive and be invincible for a certain period of time after dying. Explode after dying, causing a stun. Inflict a bind after dying. A fasterer quest clearance! The guidance of the quest becomes more detailed and the difficulty has been lowered! Portals for fast moving are hidden in every part of Magatia, so check it now in Magatia. The size of the field has been reduced and teleport portals have been added to improve the hunting environment. 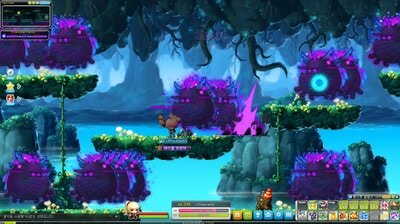 Some of the monsters are removed from the state of the skill, and the monsters appear more quickly. Reboot / Reboot 2 A new transformation in the world! Core Gemstone (Nodes) drop rate increases! In addition, some event coupons have been added! A special gift worth 70,000 won is just one click! Get a 'BEYOND Pre-Booking Box' with a variety of items including mini-coats. If you have OTP, even more gifts! 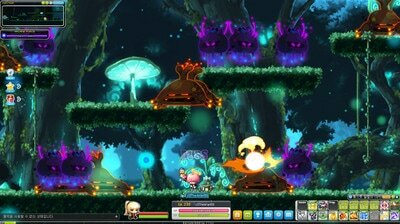 MapleStory M and Maple ID can be combined with BEYOND coins and cute costumes. The chance of storm growth is back again! Participate in the 'Mega Burning Project' where you can enjoy 1 + 2 level up benefits. Mega Burning is back! Here's your chance to level up a brand-new character. Create a new character during the event period, and choose to select that character as your 'Burning' character. The character will gain 2 additional level ups per one level up. This effect will last until the character reaches Lv. 130. Lv. 30 Equipment Box: Open to receive a weapon and armor set suitable for your class. Mysterious Chest: Open to receive a 5-hour Snail pet. Black Set: Open to receive a Black Weapon Box, Black Secondary Weapon Box, Mastery Book 20, and Mastery Book 30. Keep on Burning: Title. Untradeable. 14-day duration on stats. Req. Lv: 130. STR/DEX/INT/LUK: +10, MaxHP/MaxMP: +400, Weapon ATT/Magic ATT: +10, Boss ATT: +10%, Ignore DEF: +10%. Receive special gifts such as Maple Point! Take up the challenge with special mission from Breakthrough BEYOND right now! One character per account can claim the reward boxes. Deleting the character will not reproduce the reward boxes. Accept the quest to help a character reach Lv200 easier. In the V Breakthrough menu that appears, you need to select the current tab for your level and view the requirements needed to obtain the reward. Complete the assigned mission for each level range, and receive gift boxes at Lv140, Lv150, Lv160, Lv170, Lv175, Lv180, Lv185, Lv190 and Lv200. 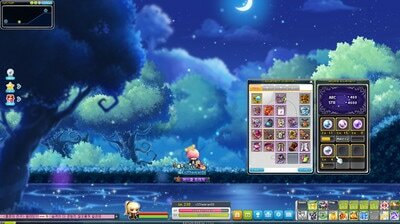 Together with Lady Blair, move your Cash Item to another character in Maple ID! Jingle Bells ~ Jingle Bells ~ Merry 25th Christmas event is happening! 1) You can get a cute Christmas costume just by logging in. 2) Decorate the Christmas Tree and earn BEYOND coins. 3) Go to the Happy Village on time and get a gift from Santa Mimic. January 10, 2017 (Wed)! Maple Story is celebrating 5000 days! We invite you to special events to commemorate the 5000th days. 1) The maple worlds, runes, multi-combo keffects have changed especially for 5000 days. 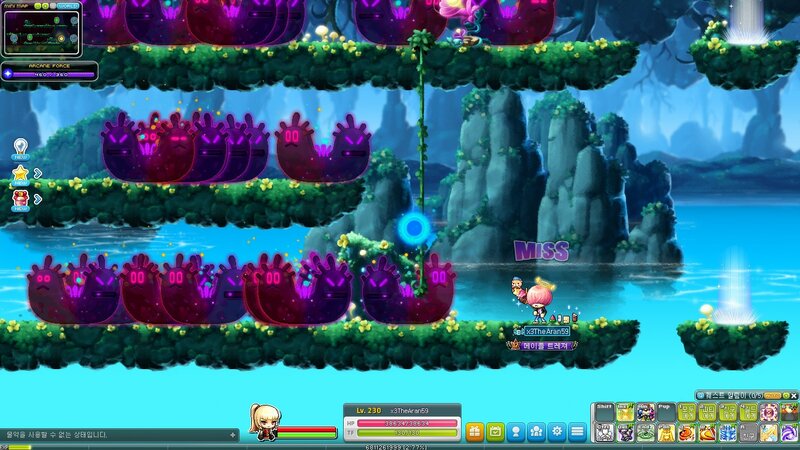 2) Say hello to celebrate 5000 days with the Maplers. You can also share your greetings and receive BEYOND coins. 3) Party cake too! Collect the candles to light up the cake. Depending on the number of candles, and you can get a gift of 100 million won in total prize. 4) You can learn 'Maple' skill through collecting candles. Enjoy hunting with cute monsters. Experience BEYOND your true powers with these newly added skills! All classes receive a new 5th job skill!! Use colorful and powerful skills and enjoy hunting. Description: Creates a shield by materializing its own life force. A materialized life force can be detonated to attack nearby enemies. Does not affect enemies in the Damage Reflection state. Description: Refines your Stealth to the extreme, allowing you to attack and use skills in Dark Sight without ending Dark Sight. Also increases damage during Dark Sight. Description: Plants a brave pirate flag to increase party members' morale and instill fear in your enemies. Not affected by Knockback effect from enemy attacks while planting the flag. Description: Summons a brave Cygnus Phalanx that charges forward while pushing enemies away. Phalanx slows down after running into an enemy and the skill key can be pressed again to change directions. Cygnus Phalanx does not affect enemies in the Damage Reflection state. Description: Gain the power Freud the Hero left behind for his friends. Description: Summons a loyal Mastema for help. Mastema does not affect enemies in the Damage Reflection status. Description: Lends the power of the Nova God to punish the enemy while being blessed. Receiving Heaven's Door with Pantheon buff removes Pantheon because it does not stack with Heaven's Door. Description: Gathers the Sengoku Forces. Randomly summons two Sengoku Force warriors. Creates a different bonus effect depending on which character is summoned. Sengoku Ally does not affect enemies in the Damage Reflection state. Description: Slashes through a space with a sword containing the concentrated power of a Combo Counter. This skill does not affect enemies in the Damage Reflection status. Description: Summons a blessed hammer to attack nearby enemies. This skill does not affect enemies in the Damage Reflection status. ​Description: Beholder reveals itself and deals damage to nearby enemies. Can only be used during Beholder Dominant. This skill does not affect enemies in the Damage Reflection status. Description: Sends the enemy to place that separates the living from the dead. Attacking with schism can damage enemies in the Ignore or Damage Reflection status. Description: Focuses the power of the Soul Shield into the sword that create the legendary sword of light which use as an attack. ​Description: ASummons a Dark Dragon of the netherworld using Force as tribute. Dark Dragon's attack does not affect enemies in the Damage Reflection status. Description: Concentrates the blood of demons until it explodes and damages nearby enemies. Can be used while using Exceed skills and can be charged by holding the skill key, enhancing its attack based on the charging time. Defeating an enemy or attacking a Boss Monster recovers HP and this healing effect ignores Demon Frenzy's healing reduction effect. Description: Tempest Blades attack the enemy and stick them to the ground to create powerful flames that burn nearby enemies. Can only be used when Tempest Blades are summoned. This skill does not affect enemies in the Damage Reflection status. 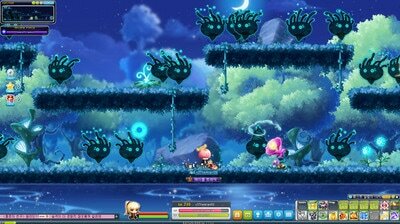 ​Description: Alpha and Beta chains an attack together. Holding down the skill key maintains the attack and once the chain attack ends, or if the skill key is released, immediately delivers a coordinated attack. Description: Rapdily releases countless punches in front. While in use, this skill activates Guard, protecting your against the Knockback effect from enemy attacks and increases the skill's final damage based on the number of time hit. Description: Shadows cast by a dawn moon attack enemies. This skill, upon hitting enemies, casts a buff that stacks up to 5 times. Can be used during Sanrenzan, Iaigiri and Shinsoku. Description: Sends forth a poison cloud to attack nearby enemies. Poison Cloud can be exploded for an additional attack. This skill does not affect enemies in the Damage Reflection status. Description: Attacks enemies in front with a charging wall of lightning. This skill Does not affect enemies in the Damage Reflection status. Description: Summons an Angel of Libra with both benevolence and vengeance. Angel and Bahamut cannot be summoned at the same time. Angelic Vengeance does not have limits regarding the number of monsters it can attack. This skill Does not affect enemies in the Damage Reflection status. Description: Gathers fire to unleash the Flame Incarnated. Can only be used when Secret Orb Flame is summoned and a different attack is activated based on the type of incarnated summoned. Consumes all flames when using and the attack is enhanced based on the number of flames consumed. Description: Mir tramples enemies in front with various techniques that utilize the strength of the dragon. Mir's skills and the Fusion skills are not affected by the Attack Speed Bonus effect. This skill Does not affect enemies in the Damage Reflection status. Description: Mir, while using Dragon Break, responds to Evan's magic to grow rapidly and breathe out mixed energy with multiple elements for a certain period of time. Imperial Breath improves in proportion to Dragon Break's level. This skill is activated when Evan casts Elemental Blast while Mir is using Dragon Break. This skill Does not affect enemies in the Damage Reflection status. [Evan] Fusion Skill: Break - Come Back! Description: Mir immediately stops attacking and returns to Evan's side. Creates a Null Domain that deals damage to nearby enemies with power of the crest. Break - Come Back! improves in proportion to Dragon Break's level. This skill is activated when Evan casts [Come Back] while Mir is using Dragon Break or Imperial Breath. Description: Summons a pentacle that resonates both light and darkness. Pentacle changes based on the Light and Dark status, but is not affected by SUnfire, Eclipse or Equlibrium's additional effects. This skill Does not affect enemies in the Damage Reflection status. Description: Places a Black Magic Altar. Place two or more altars to activate its curse. Curse stars from the altar that was placed first and transfers to the next ones in order. The curse attacks all enemies it touches 1 time, but it does not attack the same target until it reaches the next altar. The travel time between altar is fixed regardless of the distance. Additional altars can only be placed within a set range of the most recently placed altar. Enemies attacked by the curse are marked with Darkness Emblem. This skill Does not affect enemies in the Damage Reflection status. Description: Creates matter that can be moved with telekinetic powers. Matter can be moved with Psychic Force and the matter's attack speed increases based on movement speed. Using the skill again moves the matter towards Kinesis at a decreased speed. This skill Does not affect enemies in the Damage Reflection status. Description: Summons a spirit stone that strengthens both you and your party. This spirit stone absorbs Kanna's Spiritual Power and grows stronger in stages. The spirit stone effects does not stack. 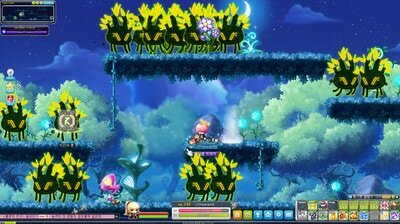 Description: The Beast Tamer's animal friends join forces to attack the enemy. This skill Does not affect enemies in the Damage Reflection status. Description: Attacks a blinding speed to create the illusion of shooting a bow. Attacking a certain number of times while in cooldown quickly activates the illusion of an attack. This skill Does not affect enemies in the Damage Reflection status. Description: Imbues the arrow with a Mysterious Powers to split into countless arrows on impact. Description: Wakes the sleeping wind spirits to cause a tantrum. Description: Sets the jaguar free in its wild form to go on a rampage. Description: Throws a giant shuriken that is said to have been used by an ancient thief clan. This skill Does not affect enemies in the Damage Reflection status, but reduces the change of Mark of Assassin activating. Description: Draws in the enemy to attack and steps behind the enemy to deliver a powerful counter. Attacking with the schism can damage enemies in the Ignore or Damage Reflection status. Description: Summons the God of Karma to attack nearby enemies. Description: Overloads the energy core to gather energy exceeding the maximum amount. MP cannot be recovered because the core is overloaded, but skills no longer consume energy and the plasma current from overloading attacks nearby enemies. Energy exceeding the maximum amount cannot be charged with Amarance Generators. This skill Does not affect enemies in the Damage Reflection status. Description: Summons a stationary shadow that mimics your actions. The shadow always faces the enemy with the highest Max HP in range. It can only mimic shuriken throwing skills and odes not have a separate HP, but disappears once the duration ends. Use the skill again to switch places with the shadow 1 time. But it can only be done if the Night Walker is on top of a platform. . This skill Does not affect enemies in the Damage Reflection status and may activate Mark of Darkness and Shadow Bat. Description: Throws a card sealed with ominous powers. Description: Surrounds you with the energy of the water dragon sealed in the deep sea to attack nearby enemies. This skill does not affect enemies in the Damage Reflection state. Description: Focus aims at the enemy to take quick shots afterwards. Description: Fires ballistic missile in an arc to attack enemies in a large area. While pressing the skill key ↑, ↓ keys are used to adjust the angle and then fired when the skill key is released. Missiles do not attack enemies directly and must hit the platforms on impact to explode and deal damage. You cannot be affected by the Knockback effect from any enemy attacks while being aimed. Description: Brings out a container that fires multiple micro missiles. Description: Places a spotlight that only follows superstars. Only superstars are allowed in the spotlight. All other enemies are damaged by the light while the superstar's abilities are enhanced. This skill does not affect enemies in the Damage Reflection state. 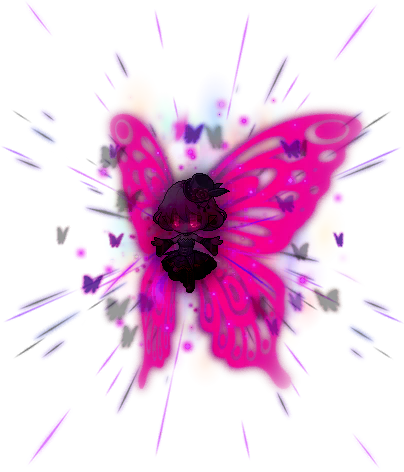 Meet Lucid's true form, and experience her full power of nightmares. Lucid's true power is finally unveiled... Are you able to go against the odds, and save the residents of Lacheln once again? How to Start: Speak to NPC Gasmask at Clock Tower of Nightmares Top Floor or via Boss UI Registration. To receive the new quest challenge against Hard Lucid, you must first clear the Showdown quest. Receive the quest from NPC Gasmask, Master of Nightmares Defeater. Defeat Hard Lucid and receive a new medal: Master of Nightmares Defeater! Upon defeating Hard Lucid, you'll be bought to the outside of the Clock Tower to hit the Music Box to obtain rewards! Fixed an issue where Dream Coin could not fit in coin purse. Fixed an issue where some skills were recognized as an attack target even when they left the battle area. Fixed an issue that was used intermittently when fasting a skill that consumes Dream Point. Items required to complete quests has been made easier. The number of items is reduced and the drop rate has been increased. The number of monsters summoned on the Lion King's Castle has been increases. The Crimsonwood Keep quest has been modified. 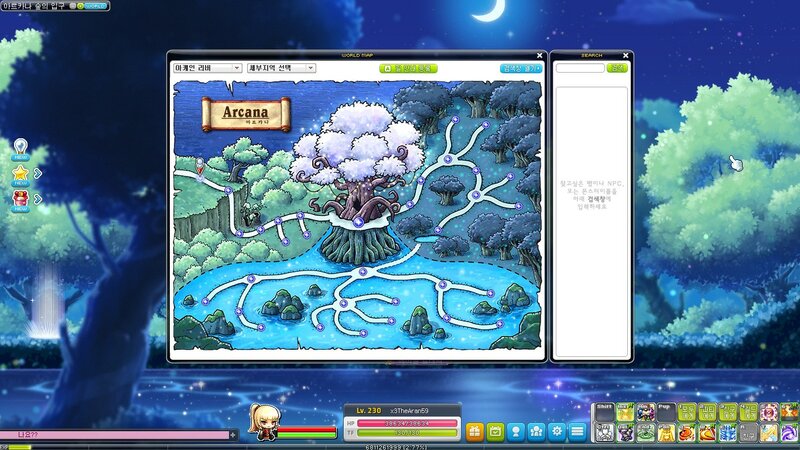 Even if you do not complete the mini game, you can proceed with the quest. After completing quest for Crimsonwood Keep, you can enter mini-game once a day. Crimsonwood Keep monsters physical strength and EXP changes. Theme Dungeon Golden Temple has been reorganized. Requirement level 130 or higher. Quest conditions and completed EXP has been adjusted. The terrain of some areas has been modified and the number of monsters summoned has been increases. BEYOND coin shop is now opened! Exchange various item with BEYOND coins! NPC Yeti's BEYOND coin shop opens in major towns. You can obtain BEYOND coins from opening BEYOND boxes that drop from monsters around your level, you can also participating in various events to receive BEYOND coins. It is important to note that in some cases, Hunt the event monster and collect the monster collection. 100 players partiticpate in BINGO! Who can win the first place? You can earn BEYOND coins based on your rankings. Enjoy special rewards every Saturday! 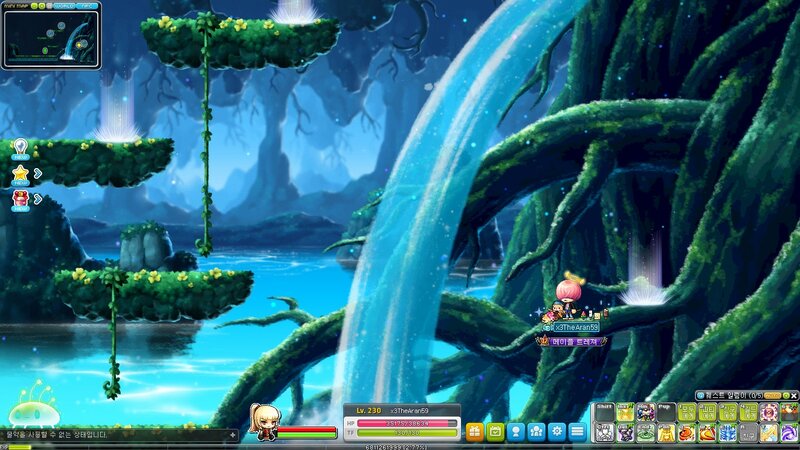 You can speak to the NPC Director Located in Henesys, Leafre, Haven and Chew Chew Island during the event. You can move your characters between worlds, the number of character can be moved without any restriction. 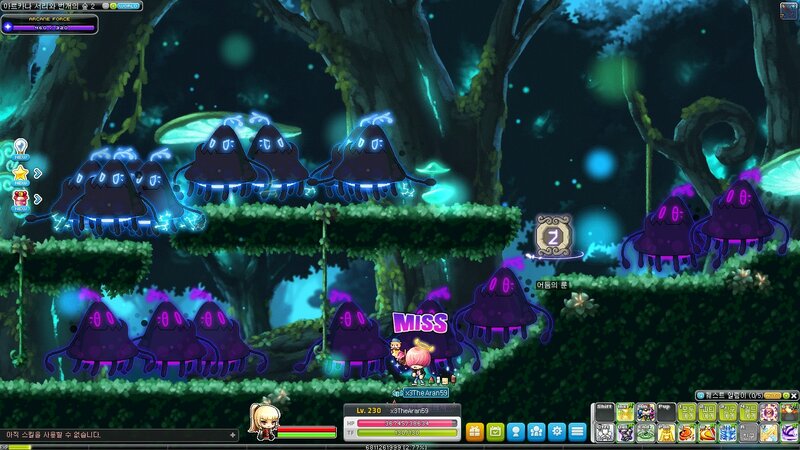 ​Theme Dungeon: Omega Sector has been reopened! Receive a call from Dr. Kim, and join forces with Mesorangers for the 'Wild Card Project'! An emeregency happened and there has been a UFO invasion in the Omega Sector, and the Mesorangers have shrunk! Help the Mesorangers regain their power and infiltrate the giant UFO! The Omega Sector Theme Dungeon will also feature new Star Force fields for your training needs! Kawoong is a Boss which is located at the UFO of Omega Sector. He makes a cleaning robot to destroy the Mesorangers daily! Speak to Dr. Gray at the UFO Interior: Flight Deck to begin your challenge. How to Start: At the top of the UFO at Omega Sector or via the Boss UI Registration. Entry Limit: Once a Day. 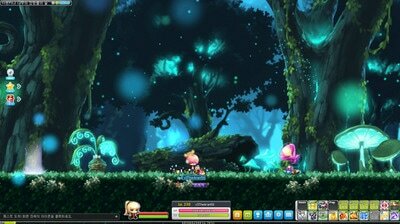 Note: Kawoong's ETC parts can be sold to Merchant NPCs for 100,000 Mesos each! 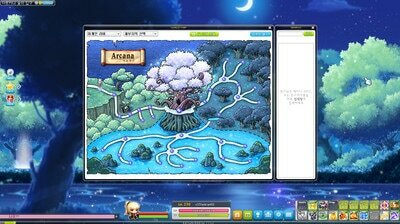 ​Maple Union system is a new system which replaces the existing Character Card and Part Time Job system. Note: Maple Union is also known as Legion System in GMS/EMS. Access the Maple Union UI through the Menu Button and selecting "Maple Union". Start Maple Union questlines by talking to Ms. Appropriation the Dragon Slayer once your Union Level is 500 or more and you have 3 Union Characters. Just like the Character Card system, each Union Member has a Character Rank based on their level. Characters must be at least Level 60 and have completed 2nd Job Advancement to become a Union Character. For Zero, the character must be at least Level 130, and only the highest-leveled Zero will count as a Union Character. 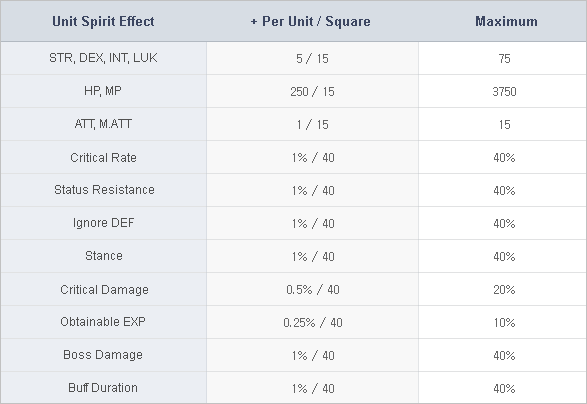 The Attacker Unit Effects consist of two effects: Unit Member and Unit Spirit Effect. The Unit Member Effect is based on each individual class. The Unit Spirit Effect is where you place your characters on the Battle Map, where you'll receive various bonus stats. To add a Union Character on the Battle Map, click the "Add Member" button. Drag and drop the character you wish to place on your Battle Map. The attack power you deal on each character is based on the Character Rank and Star Force. The effects you receive from Attacker Unit Effects is shared across ALL characters in the same world. By placing the Union Character on the Battle Map, you'll be able to receive the Unit Member Effects. Each class has it's own Unit Member Effects. If you place the same class, only the highest character level of that class will be effective. 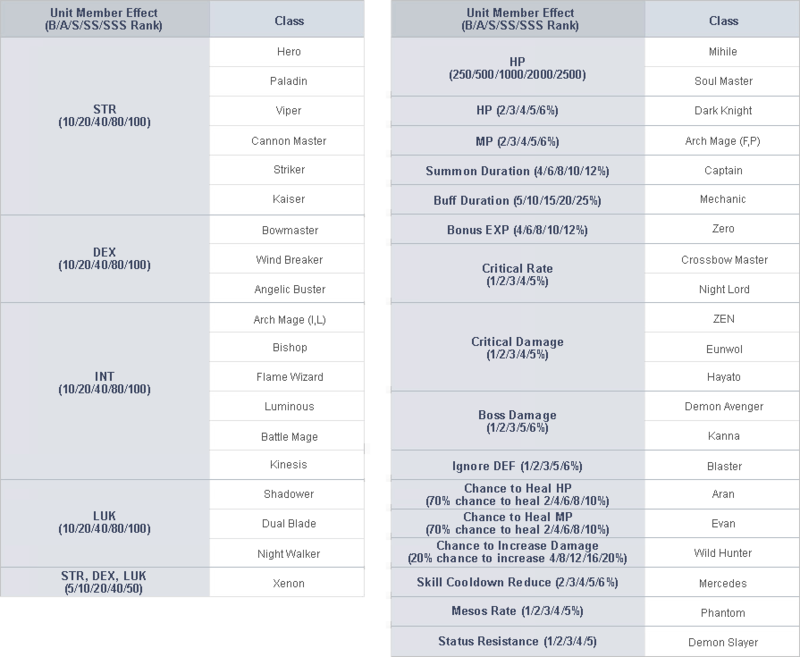 The list of each classes Unit Member Effects is as follows. Based on the area occupied by your attackers on the Battle Map, you'll be able to obtain various Unit Spirit Effects. Each job branch will be represented by different shapes, and they differ depending on the Character Rank. You can overlap two shapes on a single unit square when linking the Character Bricks on the Battle Map. Character Bricks must be linked on the Battle Map for the Unit Member Effect and Unit Spirit Effect. The Character Bricks based on Class / Rank of the Union Member is as follows. The inner square area is available regardless of your Union Rank. Stats in this area can be swapped around the Battle Map but cannot be repeated. Stats around the outer square areas are fixed. Based on your Union Rank, you'll be able to unlock one-square outline in the outer square area. 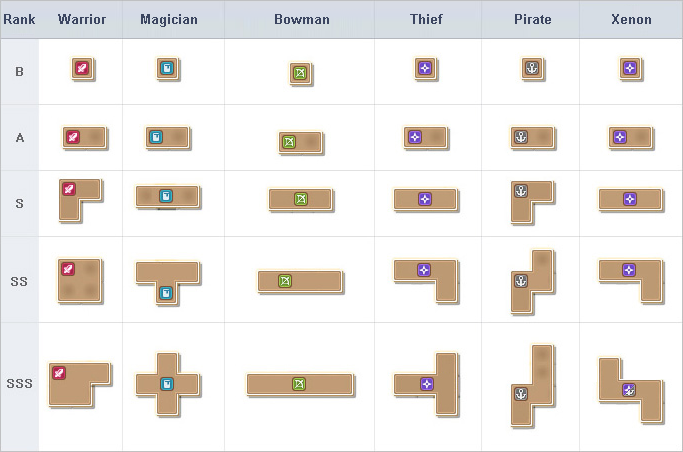 ​Achieve the following Union Ranks to unlock each line. 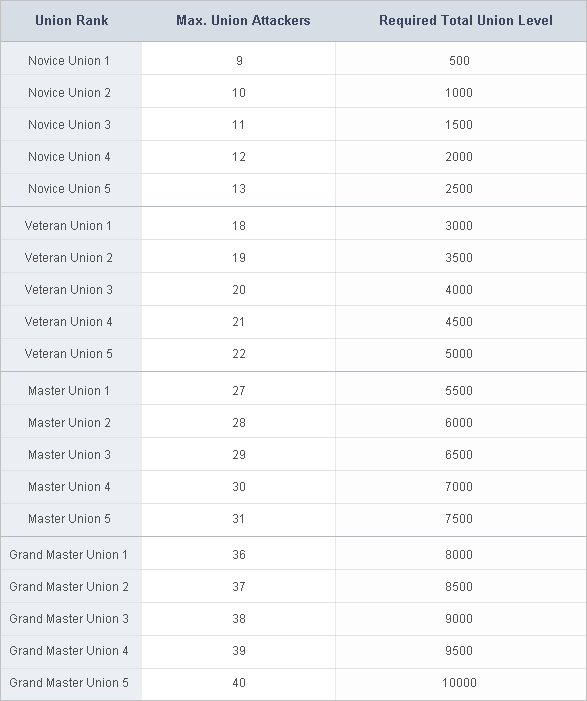 Based on your Total Union Level, you'll be able to upgrade your Union Rank using Union Coins. The higher your Union Rank, the more Union Characters you can place on the Battle Map, which allows you to have even more Attacker Unit Effects! Please refer to the table below for the list of Union Ranks and its requirements. The Union Battle is a new system fought by you and all the attackers placed on the Battle Map, which allows you to earn Union Coins! By clicking on the "Join Battle" button on the Union UI, you'll be able to fight the boss with your attackers! 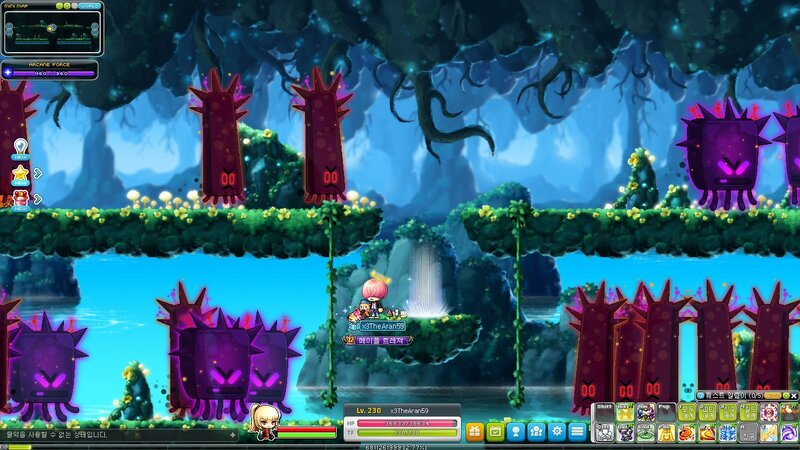 ​Inside the Union Battle, you'll see all your characters attack the boss monster in the center of the map. Attackers will deal damage based on their Attack Power. Attack Power is determined by each attacker's Star Force and Level. You can control your own character and use skills freely in this map. The boss monster will not move nor will it attack, but will summon Dragons and Wyverns from time to time, which will be used to complete certain daily quests. The Boss HP is divided into two sections: Shield HP (Purple Gauge) and Regular HP (Green Gauge). The Automatic Attacks will damage the Purple Shield HP gauge first. The Purple Shield HP Gauge can only be damaged by your Battle Map Attackers automatic attacks. The Green Regular HP Gauge can be damaged by your currently controlled character. When the boss is left with the Purple Shield HP gauge, your currently controlled character will not be able to deal damage to the boss. The Boss HP is updated every 5 seconds. 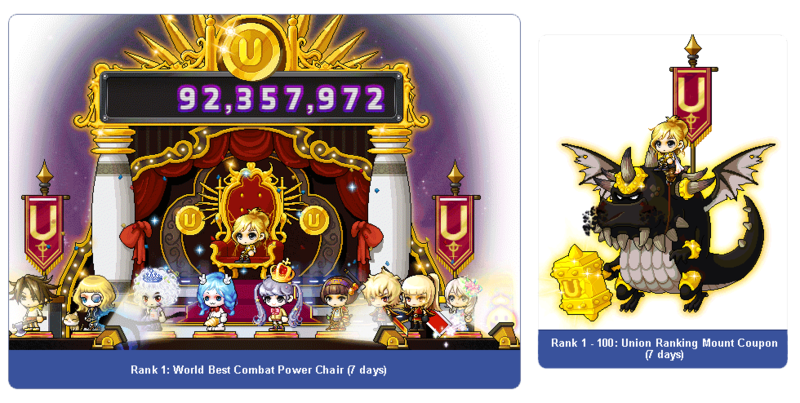 Every 100b damage dealt to the boss will reward 1 Union Coin. Even if you're offline or not in the Union Battlefield, your attackers placed on the Battle Map will still continue to deal damage to the boss and accumulate Union Coins. Simply enter the Union Battle time to time to collect your hard-earned Union Coins by your Maple Union! All Union Coins will be credited upon exiting the Union Battlefield. Daily quests are available to obtain even more Union Coins! Union Coins can also be used to purchase various items from the Union Coin Shop! The Union Coin Shop purchase limit is reset every Monday at midnight. Arcana Arcane Symbol can be obtain from Arcana monsters.